My oldest son was turning 17 and every time I asked him what cake he would like for his birthday I got an 'I don't know' kind of answer. On the morning of his birthday, this is what I decided to make him. 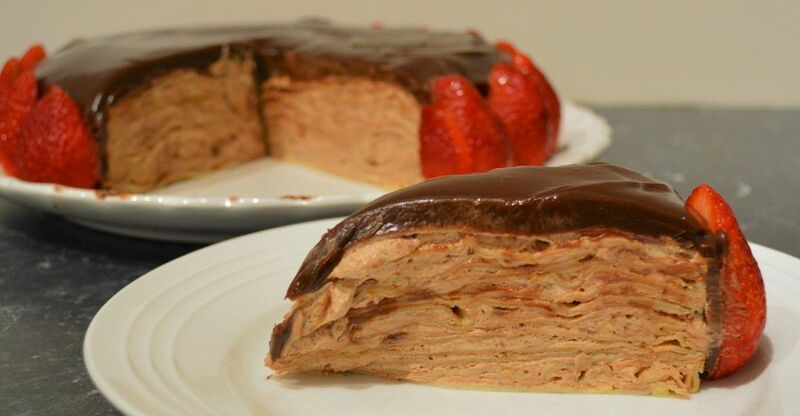 This is a cake made with layers and layers of crepes sandwiched together with a nutella cream. On top is a chocolate glaze that is thick and lushes and simply divine. This cake is light and creamy and every thing you want a chocolate cake to be. If you don't use up all the chocolate glaze, any leftovers is delicious on ice cream, so much better than store bought toppings. Make the Hazelnut Cream: Using an electric beater, whip the cream until stiff peaks form. Add 1/3 of the whipped cream to the nutella, fold in gently to loosen the nutella, then fold in the rest of the cream until well incorporated. Refrigerate until ready to use. Chocolate Glaze: In a small saucepan over medium high heat, bring cream, corn syrup, and salt to a boil. Remove from heat. Add chocolate and coffee. Stir until all chocolate is melted and the glaze is glossy. Let cool completely, it thickens while cooling. Candied Hazelnut: Thread each hazelnut onto tip of a long wooden skewer; set aside. Place a cutting board along the edge of a counter top; set a baking sheet on the floor next to the edge, directly under the board. In a heavy saucepan, cook sugar and ¼ cup water over medium heat, stirring occasionally until sugar has dissolved. Continue to cook, without stirring, until syrup comes to a boil. With a wet pastry brush, brush the sides of the sugar mixture to prevent crystals from forming. Let it boil until syrup turns light amber, about 5 minutes; remove from heat. Let it stand until slightly cooled, 6 to 8 minutes. Dip 1 skewered hazelnut into syrup, coating completely and letting excess syrup drip back into pan. When dripping syrup becomes a thin string, secure end of skewer under cutting board. Let caramel drip over edge onto prepared sheet. Repeat with remaining hazelnuts. Let stand until caramel has hardened, about 5 minutes. Break strings to about 8cm. Carefully remove skewers. Drizzle ½ of the thickened chocolate glaze on top of the cake and let it drip to the sides. 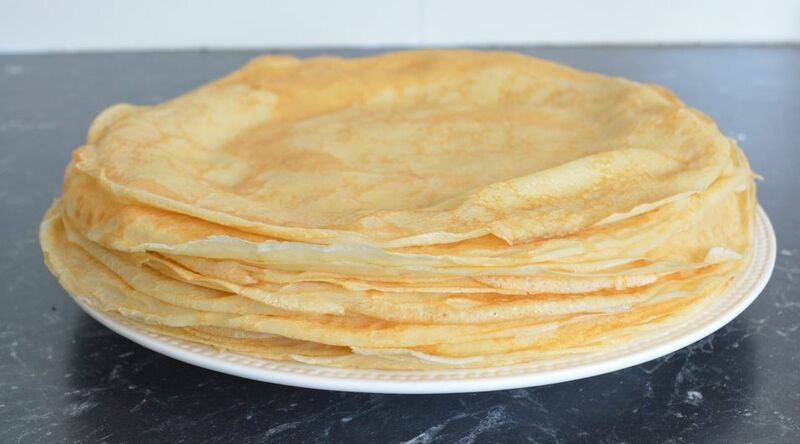 Spread remaining glaze around the sides of the cake and make sure all crepes are covered completely. 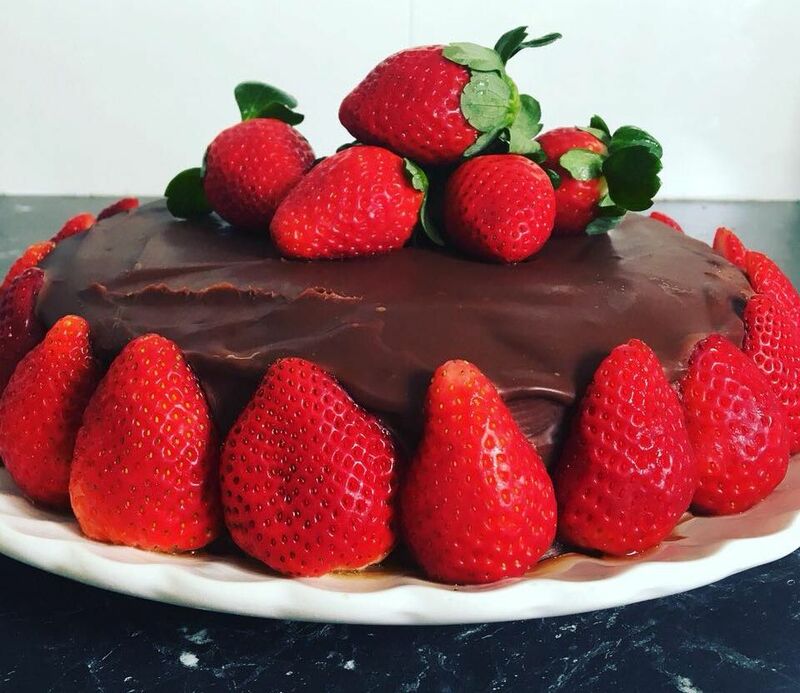 Decorate with strawberries. Refrigerate until glaze is firm, about 30 minutes.